TekMark Australia announces the launch of the new Tektronix MDO3000 Series mixed domain oscilloscopes. The Tektronix MDO3000 is the ultimate integrated 6-in-1 oscilloscope that offers a spectrum analyser, logic analyser, protocol analyser, arbitrary waveform generator (AFG) and digital voltmeter (DVM). Recent market research indicates that 40% of embedded design projects include some form of wireless capability. For instance, 25% of oscilloscope users use a spectrum analyser multiple times per week. Customers are increasingly expecting standalone instrumentation to be integrated into the oscilloscope as well as instrument upgradeability. To make MDO products available to more customers, the new MDO3000 Series offers a standard spectrum analyser and addresses important market trends of increased instrument integration and upgradeability. 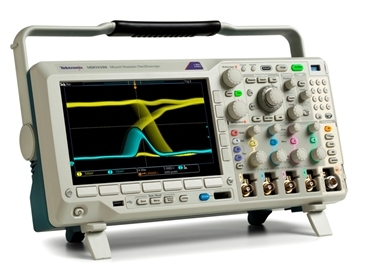 By integrating a spectrum analyser, logic analyser, protocol analyser, arbitrary function generator and digital voltmeter into an oscilloscope, the MDO3000 clears the design bench of costly, specialised equipment and provides the tools needed to test and debug virtually any embedded design. Tektronix has also developed the MDO3000 to be completely customisable enabling customers to select the functionality and performance needed now and well into the future. The MDO3000 offers the functionality of six independent instruments without the significant cost of separate instruments. Dave Farrell, general manager, Mainstream Oscilloscopes at Tektronix explains that the case for integrated, multi-instrument oscilloscopes is extremely compelling on multiple levels. In addition to cost savings, the MDO3000 saves space on the engineer’s bench, improves usability with the same basic controls for multiple instruments, and ensures engineers always have access to all the instruments they need. When compared to both standalone oscilloscopes and basic spectrum analysers in this class, the MDO3000 mixed domain oscilloscope provides best-in-class performance and features, offering the convenience of a single instrument without performance trade-offs. With the MDO3000 Series, engineers can start with the minimum performance and functional levels they need to accomplish the project at hand with the knowledge that their test platform can be upgraded in the field without delay. Performance upgrades include analogue bandwidth of the oscilloscope and input frequency of the spectrum analyser, while functional upgrades include the addition of digital channels, protocol analysis, arbitrary function generation and digital voltmeter measurements. The MDO3000 Series oscilloscopes feature 2 or 4 analogue input channels with bandwidth ranging from 100 MHz to 1 GHz, 16 digital channels (optional) and one RF input channel matching the bandwidth of the oscilloscope (9 kHz up to analogue bandwidth). The RF input frequency on any model can be extended to 3 GHz. Based on the MSO/DPO3000 mixed signal oscilloscope series, the MDO3000 provides industry-leading debug functionality. With the new FastAcq feature, the MDO3000 oscilloscopes offer 280,000+ waveforms per second capture rate displayed on a vibrant digital phosphor display for easily finding infrequent anomalies in a signal. More than 125 available trigger combinations, automated serial and parallel bus analysis, innovative Wave Inspector controls, and optional automated power measurements round out the feature-set, and ensure comprehensive tools for every stage of debug. The integrated, optional 50 MHz AFG functionality is more than two times faster than competitive offerings with eight times the arbitrary waveform record length. The integrated digital voltmeter (DVM) provides 3.5-digit AC RMS, DC, or AC+DC RMS voltage measurements, as well as 5-digit frequency measurements in a large, easy-to-read display that makes changes in readings instantly visible. The DVM feature is available free of charge when an MDO3000 product is registered.